The President and CEO, Robert Lilligren, of the Native American Community Development Institute (NACDI) announced the appointment of Rory Erler Wakemup as new Director for All My Relations Gallery. Wakemup brings to the organization 20 years of experience in contemporary Native arts as a student, artist, and curator. 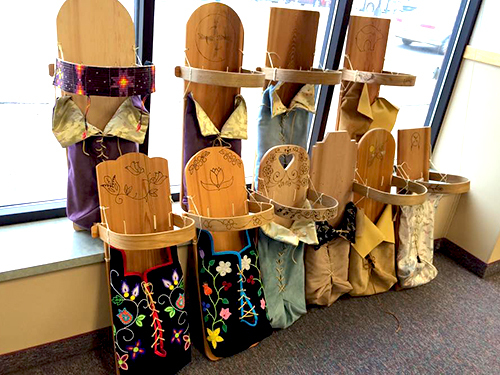 As the Youth Activities Coordinator for the Golden Eagle Program at the Minneapolis American Indian Center, Rory introduced local youth to art activities and a wild rice camp at the White Earth Reservation. Wakemup, who received his MFA from the University of Wisconsin, Madison in 2015, cofounded a successful visual arts gallery in Santa Fe, NM. 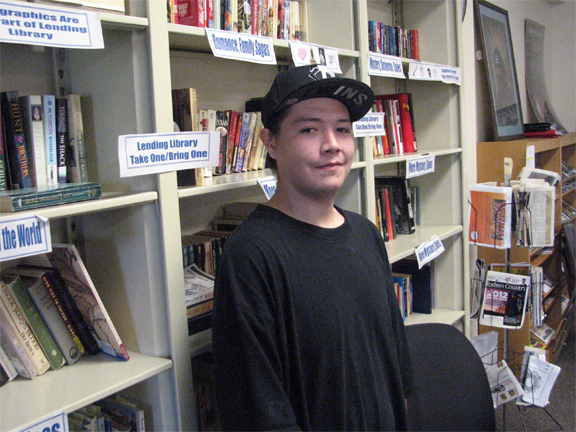 Wakemup brings an artistic and gallery background to the All My Relations Arts program. 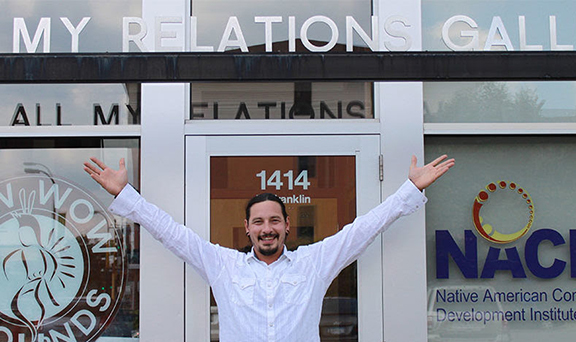 “I am excited and humbled by the NACDI team’s invitation to serve as the Director of All My Relations Arts. As both a Native artist and a committed community member, I am thrilled to begin a role that allows me to work closely with the American Indian community in Minneapolis – one that I consider to be my home and people,” says Wakemup. Wakemup started his work as AMRA Director on August 15. Governor Mark Dayton has appointed American Indian OIC’s president and CEO, Dr. Joe Hobot, to the Minnesota Job Skills Partnership board. The Minnesota Job Skills Partnership works with businesses and educational institutions to train or retrain workers, expand work opportunities, and keep high-quality jobs in the state. The board is comprised of public, private, and educational leaders who are tasked with ensuring the ongoing stability and growth of the state’s economy and labor force- principally through the management of the Dislocated Worker program and the issuance of grants and other supportive measures. In his role as a member of the board, Dr. Hobot will ensure that underrepresented communities, particularly the American Indian community, remain a part of the conversations, planning, and resource allocations administered by the Minnesota Job Skills Partnership. The U.S. Department of Education announced that the Fond du Lac Tribal and Community College was selected to participate in the new Second Chance Pell pilot program. Featuring a renewed partnership between Fond du Lac Tribal and Community College and the Minnesota Correctional Facility-Shakopee, the college’s application was selected as one of only three Second Chance Pell pilot program sites in Minnesota. The Second Chance Pell program allows incarcerated individuals access to Pell Grants for college courses delivered online and in person. The college will serve an estimated 45 students each year who are incarcerated at the prison in Shakopee. Pine Technical College and South Central College were the only other Minnesota colleges to receive Second Chance Pell program funding. Across the United States, selected colleges and universities will partner with 141 federal and state penal institutions to enroll approximately 12,000 incarcerated students in educational programs. Through the pilot program, colleges may provide federal Pell Grants to qualified students who are incarcerated and are likely to be released within five years of enrolling in college coursework. The Second Chance Pell is an experiment started last year to test whether participation in high quality education programs increases after expanding access to financial aid for incarcerated individuals. The pilot program allows eligible incarcerated Americans to receive Pell Grants and pursue postsecondary education with the goal of helping them get jobs when they are released. A 2013 study funded by the U.S. Department of Justice found that incarcerated individuals who participated in correctional education were 43 percent less likely to return to prison within three years than prisoners who did not participate in any correctional education programs. The study also estimated that for every dollar invested in correctional education programs, four to five dollars are saved on three-year re-incarceration costs. The Minneapolis Indian Health Board has been awarded the 2016 G. Scott Giebink Award for Excellence in Immunization. The organzation was nominated by Immulink, the Hennepin County-based organization that provides MIIC support to the 7 county metropolitan area. IHB was one of four nominees that was presented to the selection committee made up of MDH staff. The committee selected the organization because of their excellence in MIIC use and data interoperability. Some of the activities considered for the award were: First organization to have bi-directional MIIC data exchange, Excellent use of immunization assessment reports, Excellent data quality and MIIC participation and High immunization coverage for clinic population. The American Indian OIC (AIOIC) was recently recognized by the First Nations Development Institute, the Kresge Foundation, and the National Urban Indian Family Coalition for its work helping Native Americans living in urban areas attain meaningful employment. Dr. Patrick Rock, CEO of the Indian Health Board of Minneapolis, has been named one of the “100 Influential Minnesota Health Care Leaders” based on nominations from the Minnesota Physician’s readers. Every four years, Minnesota Physician recognizes the 100 most influential health care leaders in Minnesota.